Habitat alteration, fragmentation and loss are collectively considered to be the primary challenge in the conservation of amphibians and reptiles (i.e., herpetofauna). With herpetofaunal populations declining, and human populations expanding and using more land, PARC has developed a series of regionally specific best management practices, or Habitat Management Guidelines (HMGs) to provide proactive guidance for improving the compatibility of land management practices with these animals. These guidelines are not regulations, nor are they in any way an attempt to limit landowners’ rights. They should simply be regarded as recommendations for landowners and managers to consider the needs of amphibians and reptiles in the course of their management activities. The HMGs are directed towards resource managers and private landowners who have a desire to help protect amphibians and reptiles. If many landowners and land managers each implement some of these guidelines, then the cumulative effect can only be a positive one. 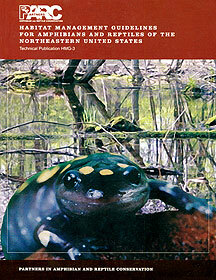 We have not created a guidebook that describes the needs of every species of amphibian and reptile. Instead, we provide regionally-specific guidelines for managing habitats with the goals of keeping common species common, stemming the decline of imperiled species, and reduce the likelihood of species becoming listed as threatened or endangered.